"So...you're telling me there's a chance...YEA!" Meryl Streep has now won a 3rd Oscar for acting - joining a very small club of 3 time Academy Award winners in the acting category. She joins other three timers Ingrid Bergman, Walter Brennan, and Jack Nicholson. Katherine Hepburn is the only actor or actress with four Oscar wins in the acting category. So, Streep proves that three is still achievable (although it might take 17 nominations to make that happen). Below is a list of people who perhaps were cheering on the inside when she won, saying in the spirit of Lloyd Christmas, "So...you're telling me there's a chance." The 84th Academy Award ceremony has ended, and I have to say, for having a potentially unmemorable collection of films, the award ceremony to me seemed like one of the best. The ceremony moved along, it seemed relatively gimmick free (the throwback to the joy of movies sort of hit that gimmick point a few times, but I chalk it up to "theme" more than gimmick). But I don't think it will be the best picture win for The Artist that is the big story, or the memorable moment from tonight's ceremony. 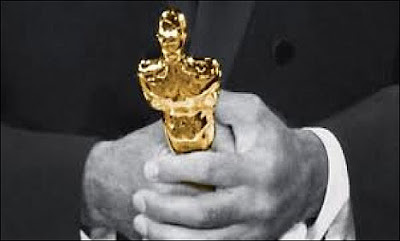 It won't even be the 5 Oscars won by Hugo -- yes, FIVE OSCAR WINS (art direction, cinematography, sound, sound editing, visual effects). Instead it will be that with 17 Oscar nominations under her belt, Meryl Streep won her third Oscar. She won a supporting actress trophy in 1980 for Kramer vs. Kramer, and then in 1983 for Sophie's Choice. But since then it's been an unprecedented amount of award nominations without a win. This has only reinforced the thought that the academy only wants to award an actress with two nominations. Katherine Hepburn has 4 wins, but beyond that there seems to be a ceiling for two wins with a handful of women with this honor (Bette Davis, Ingrid Bergman, Jane Fonda, Elizabeth Taylor, Olivia de Havilland, Glenda Jackson, Jodie Foster, Sally Field, Vivien Leigh, Louis Rainer, and Hilary Swank). But this win for Meryl is historic - not to mention surprising since best actress precursor love clearly rested with Viola Davis, especially with her Screen Actors Guild win. Beyond that, props to Billy Crystal and Brian Grazer for hosting and producing in a way that kept the night moving forward and the event classy. Excerpt From Audie Cornish's interview with critic Bob Mondella on NPR. CORNISH: So let's talk briefly about the movies. Now, are you seeing any trends this year in the films that are getting the most Oscar attention? CORNISH: Right. I think "The Descendants" is the only film that is actually set in the now. MONDELLO: Right. And I think that speaks to something about our feelings in general and maybe the Academy's feelings about this year's pictures, which were not necessarily the blockbusters. I mean, that's the other thing. If you look at the blockbusters this year, all of the top 10 pictures, practically, were sequels, so that they are looking back, too, in a way. And it's been a lot of - OK, this year has not been a great year for a lot of people, economically and a lot of other ways. Let's look back. I thought I would test 2011 against the same standards. Who's the only name to appear twice...?? Tyrese Gibson with roles in Transfermers: Dark of the Moon and Fast Five. Note: You could claim Jeremy Renner appears twice as well, but the role in Thor is truly a cameo, so I do not count it for the purposes of this list. In my last post, I wrote about John Goodman's appearances in two Oscar nominated best picture films. 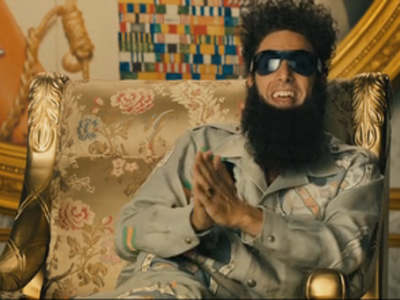 John Goodman is not the only one who holds this honor of showing up in two 2011 Best Picture film. In fact, you start putting together a list like this and start to either think Hollywood is a very small place or that certain actors are working very hard. Three of these, Chastain, Davis, and Pitt are attending the ceremony as nominees (Chastain and Viola Davis for The Help and Brad Pitt for Moneyball). One of the surprises of the 2011 film season to me was that John Goodman shows up in two Oscar nominated films (Extremely Loud & Incredibly Close and The Artist). Now, John Goodman's role in neither of these films is substantial, but it's interesting to think how his career is continuing, or maybe even growing past his sitcom years on Roseanne. But I think John Goodman (or his agent) has done an excellent job keeping Goodman busy in diverse roles, and in fact, I have to say, I'm starting to think maybe I don't respect John Goodman's skills. He's found a role in a number of films of all types - whether it's voice work in animated films, extended TV roles, or of course, there's always The Big Lebowski. But when I look at John Goodman's release schedule for 2012 he's not stopping and I have to wonder if John Goodman will be in a 2012 film that will be in the "best picture mix." 2012 is a lot of voice work, as seems to be John Goodman's bread and butter (he plays Paul Bunyan in Bunyan and Babe and has a role in Focus Feature's stop motion film ParaNorman). But on a more interesting note, I'll be interested to see how John Goodman does in Ben Affleck's feature Argo about the 1979 Iran hostage crisis. Goodman plays John Chambers a make-up artist who helped the CIA with military transformations. Another interesting potential, is Robert Lorenz' Trouble With The Curve. Lorenz who has worked closely over the years with Clint Eastwood, including co-producing and assisting in directing many of his most respected recent film, will be making his feature film debut. Trouble With The Curve is the story of a elderly baseball scout taking his daughter on the road. The film stars Clint Eastwood and features Amy Adams, Justin Timberlake and John Goodman. I have to be honest, my eyes on Argo and Trouble With The Curve for 2012. John Goodman could once again find himself in the mix of award season. My wife and I for whatever reason decided we start 2012 off with the films of 1947. We didn't limit ourselves to the best picture nominees, but instead tried to soak up some additional film from 1947, including It Happened on Fifth and Out of the Past. The best picture nominees for the 1948 ceremony for the films of 1947 feature a unique mix of films that certainly paint a picture of the times. You have the light hearted contemporary Christmas films, The Bishop's Wife and Miracle on 34th Street which present a unique contemporary picture. In many sense, creating a snap shot of values and a time of returning to post-war financial security and visions for growth. Then, mix in the well done film version of Great Expectations for a splash of period film. Finally, you get the two different social issues films - one the dark low budget RKO film Crossfire which deals with the idea of hate of a certain type of person (in this case, Jewish) being the reason why someone might commit a crime. 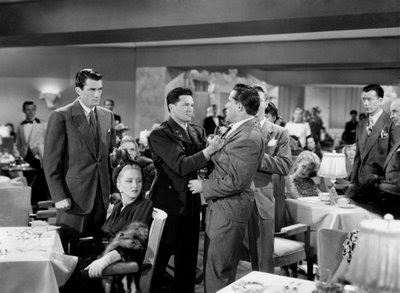 This film's inclusion serves as a unique compliment to the Oscar winning film Gentleman's Agreement. Gentleman's Agreement stars Gregory Peck as a reporter who pretends he's Jewish to experience first hand what anti-semitism truly feels like. This social message film by Elia Kazan ends up being a piece of history later with some of the House Un-American Activities Committee going after many people involved in the film, increasing the film's "historical" value, beyond it's best picture win. That being said, of all these films, I find myself really enjoying them all, with the exception of Crossfire which is frankly just a little hard to enjoy, as the films "gritty style" is in a genre that has developed significantly over the decades, and even for films of it's time in the same category, I find many films to have a stronger story. My favorite part of Crossfire is the way that the credits and various cover art just always looks a little funny with all three male leads being named Robert (Robert Young, Robert Mitchum, Robert Ryan). Frankly, I loved the 1947 film series at our home, and thank that this collection of films from the year. Film still from the film Gentleman's Agreement from Film Foodie. It was probably in 2003 when phone ringtones were generally funky sounding midis, and I put Coldplay's The Scientist on my phone. I love the song, and don't really know what it's even all about, but I enjoy the ballad from the fantastic album, A Rush of Blood to the Head. With the Grammy Awards playing in the background my eyes were instantly pulled to the screen when the song started playing on a commercial, this time with Willie Nelson singing, and a real unique picture/short film style message about more natural animal environments. The advertisement (or should I say short film) is an advertisement for Chipotle that puts a story to the song that is ad genius. And it's kind of random in it's own way as well since this song is past it's prime coming out about 10 years ago. 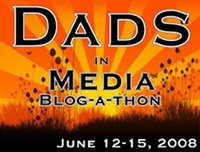 The above advertisement is shared as an impressive piece of work - not as an advertisement for any benefit to this blog. I just think the video and way it uses Coldplay's hit song is pretty incredible. If you haven't seen it, enjoy. When Touchstone Pictures released the film The Help in August of this past year, I have to trust that their choice was based on the thought that the August release date would be the best financial release date for the film. August seems to be the prime release date for a "book club favorite." This type of August release still gives it a summer film status without the early replacement by the next big superhero or talking dog movie. Yet, as soon as the Oscar field expanded from it's traditional 5 film nomination status, I have been curious to see if that might spread out the release dates of Oscar winning films. It's hard to tell how a widened Oscar field impact studio release plans, but at a minimum it seems like summer brings a couple Oscar nominees every year for the past couple year, with around three May/June/July/August films receiving an Oscar nomination. 2011's films were not an exception. I won't complaint about critically acclaimed films being released before thanksgiving and being remembered in time for Oscar season. *Pictured above, Viola Davis in The Help. 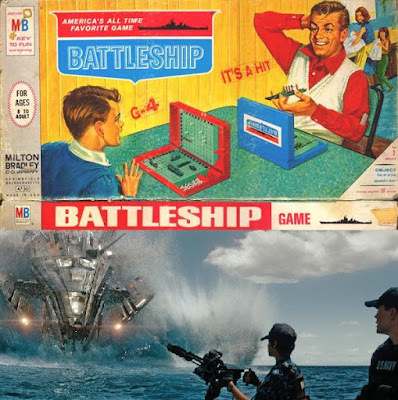 I certainly remember playing Battleship as a kid - it wasn't the talking battleship version ("You Sunk My Battleship") and it wasn't the original old school paper version. But for me the vision of the Battleship game always seemed to be a war context with coordinates being used to send torpedoes or other ship related weapons to sink the ships. Perhaps the ships are masked in fog or conditions that require coordinate precision instead of the ability to judge by sight alone. So, I'm not sure that you are allowed to have expectations when a simple board game is turned into a feature length film. Yet, the science fiction element and the previews for this film (which looks like a boring version of Transformers), certainly doesn't meet my exceptions. I just hope Peter Berg doesn't direct more sci-fi version of games. I can only horrifically imagine an alien version of Risk, or shape shifters buying up houses on Boardwalk in Monopoly. I have a feeling you agree. Over the past couple years I have been tracking Super Bowl Movie commercials and their resulting box office results to see how they fared. Last year saw a swell of film ads and this year, unless we're suprised, is a much more limited list. Here's the link to the post from 2010 & 2011. Super Bowl Film commercials from last year are listed below - a quick look will indicated some successes and a number of failures - so perhaps that why we see fewer film commercials this year, after a swell from last year.